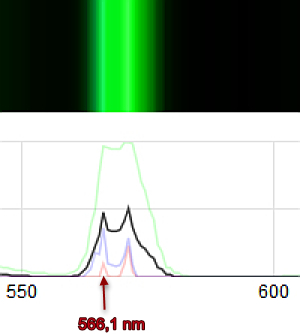 What I wanted to do this time is to take a series of spectra of the same CFL lamp in fast succession ("spitfire") at 0.1 seconds intervals over a period of 10 seconds and have a look at the sharpest intensity peaks only. The questions were: do the peaks move side to side? Do the intensities vary? How much? This is part of my examinations of reproducibility of data using the PLab spectrometer 3.0. I expected to find variations in intensity curves as the lamp was flickering noticably. But will the peaks always stay at the same wavelengths, thus giving a "light fingerprint" of the lamp that is reproducible? I try to build up on the results of @stoft who found out that single webcam pixels (in my case the peak at a certain wavelength) are not affected by neighbouring pixels at all and that intensity variations in single pixels (wavelengths) occur pretty randomly and not predictably. I also refer to my own earlier noise-by-colour studies. For this study I will look at two very distinct peaks - one at 571.1 nanometers and the other at 566-567 nanometers. Although red and blue (and of course average) seem to follow roughly the same wobble pattern, the blue curve wobbles much more at this peak. Although it is not as clearly visible at this peak the blue curve still has a greater "wobble" than the other channels. But what is more interesting, is that at this peak the overall noise is much higher than at 571.1 nm at the same points in time. We have different peak intensity changes at different peaks at the same time! This fits with @stoft s results that each pixel reacts independantly but makes reproducible results for intensities (for example in oil dilution experiment rows) much more difficult to achieve. Here you can see a comparison between the blue peak intensities at the same points in time at 566.1 and 571.1 nanometers. There is no recognizable pattern between them. b) I think we probably can bury the idea that spectral intensities always relate to ammounts of a certain atom or to a certain type of atom when taking spectra with our PLab 3.0 spectrometer. The next step will be to assess if the peaks always stay at the same exact wavelengths. These screenshots show that the peaks are pretty stable wavelengthswise. The blue peak is broader than the red peak so you notice a slight wiggle in the red over three or four pixels. 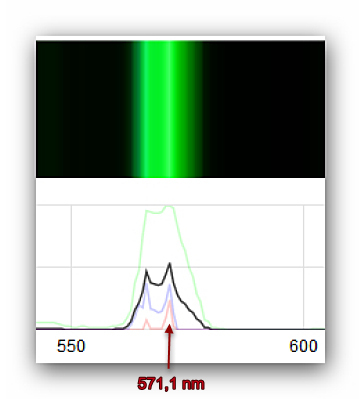 Although green is clipped it is always clipped at the exact same place (wavelength). These are the first hints that concerning the wavelengths the peaks are pretty stable to sideways wiggle. Looks like good confirmation of what I observed -- although the clipping does distort the data. Yes, the noise at sample rate is not AGC (that loop bandwidth would be a much lower frequency) so I'd agree is it just noise, mostly Gaussian and largely independent per pixel -- it's just a webcam, not a sensor for an expensive DSLR. The difficulty with measuring sharp spectral peaks (using 640pix webcams) is that they are operating close to 1pix/nm resolution and the source's true spike bandwidth is much more narrow. This results in the spectrometer's 2-3nm effective bandwidth 'spreading' the narrow source signal some and asking only 1 pixel to define the peak. This is why time-averaging independent pixels helps -- though it cannot add more points. In theory, given a totally stable system and given sufficient number of samples over time, sub-pixel interpolation could be calculated, but that approach wouldn't work across the variety of hardware and configurations. This is also why the PLab 3 paper and Velcro design was so bad -- the mechanical noise of the grating-camera position variation directly contributes to what you term as "sideways wiggle'. Stabilizing those mechanics, at least reduces the error more to just the degree of alignment between the signal peak (optical) and the camera pixel array.